We give God the glory for His many blessings upon our lives and the ministry in Africa. All of the testimonies below wouldn’t have been possible without Him firstly and secondly, without your support for this worthy cause. Truly, you are touching lives in Africa and your presence is felt everywhere even within the forest and jungles of Africa. People have places for worship, students receive free education, and free meals every day. Women are being empowered with vocational skills, and pastors and church leaders are being trained to become effective in ministry. All of the above is made possible by your daily prayers and regular support for the work in Africa through OFWB International (Board of Foreign Missions). We thank you very much. We can assure you that our good Lord will always increase every seed that you sow into the lives of the people here in Africa. Amen! Caleb’s Dollar Ministry schools resumed on September 3, 2018. We want to thank you for your generous support to Caleb’s Dollar Ministry which is helping to provide free education and free meals to less fortunate kids. Through this program we have helped thousands of children every year acquire elementary, and secondary education, yet free of charge, as well as free meals. 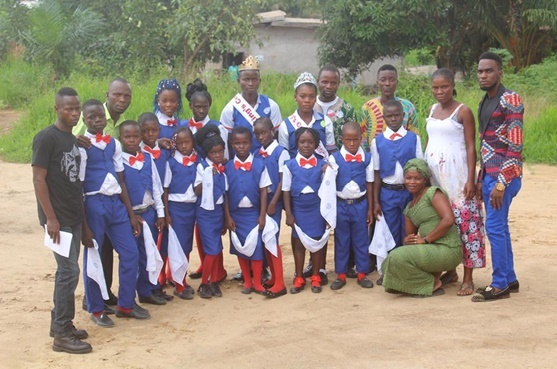 This year again, I was so excited as many students graduated from Kindergarten and Elementary division of our four schools we currently operate across Liberia. I could see joy and happiness all over the faces of the parents, as they have hope for a better future for their kids, and the kids as well as they are not left behind because of lack of funds. Truly you are making dreams come true. We want to thank you for your support for this academic year in providing free education, free meals, and also for providing allowances for the teaching staff and the cooks across the country. God bless you. 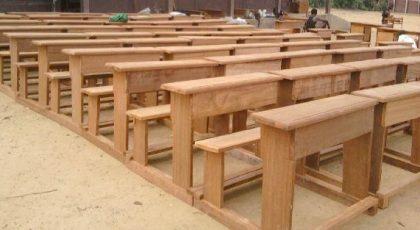 The schools appealed for chairs and benches as most of the chairs were damaged after some years of use. There is currently a shortage of chairs and benches to host this academic year which started on September 3, 2018. (We have already sent $2,500. If you decide to take part in these projects, please contact our office before sending funds. Thank You.) We are hoping to provide 400 chairs/benches, that is 100 chairs per school. The cost of the 400 chairs is $4,000 at $10 per chair. 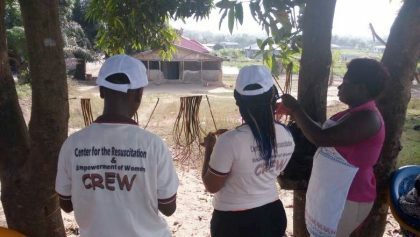 The Center for the Resuscitation and Empowerment of Women (CREW) held its first graduation exercise in June. The initiative was launched in March of this year in an effort to help empower women in our churches and communities to be self sufficient and help their families as well as support their local churches. The School is a part of the Caleb’s Dollar Ministry. 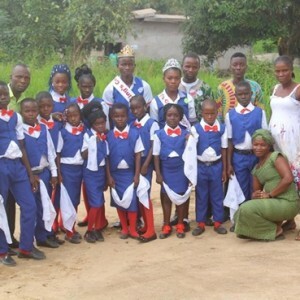 It is a free school, because most women and girls cannot afford to pay for their studies. We have hired teachers from other schools to help us in training the women and girls. During the program the graduates exhibited some of their works which includes soap and cloth they had made during their training program. It was such an awesome time as parents, and families came to grace the occasion. We are grateful to God that we can be used to be a blessing to many women and girls. Our key focus areas are Tie Dye and Soap Making, Hair Dressing & Cosmetology, Baking, Hospitality, tailoring among others. This year only the soap making and Tie Dye ended their studies, other departments did not end the course of study due to lack of funds to purchase training materials and also help give allowance to their teachers. The next Phase for the training began in August.. In this phase we are praying to also offer computer studies. We need your support to help carry on this initiative by providing training materials and help in providing an allowance for the teachers. Training materials include baking and pastry tools, sewing machines for tailoring department, as well as computers and materials for soap making. For initial starting of the school we estimated material cost at $1,750. Five teachers will be teaching, 1. Computer, 2. Tie Dye/Soap Making, 3. Pastry and Hospitality, 4. Sewing and Fashion Design, 5. Hair Dressing and Cosmetology, with an estimate of $40 per teacher per month for each cycle (4 months per cycle). We need your support to make this possible. We shall be grateful to receive assistance in this area, as students are coming into the school hoping to receive life skills that will transform their lives.